Renesas Electronics Corporation (TSE: 6723), a premier supplier of advanced semiconductor solutions, is announcing the release of the GUI CAR (Customizable Analysis Report) Tool, an innovative safety analysis tool that will enhance customers’ ability to quickly integrate Renesas products into their safety-critical automotive systems while increasing user confidence in system compliance to the latest safety standard. The powerful new FMEDA (failure mode effects and diagnostics analysis) tool is optimized for the ISO 26262 standard, which addresses safety of electrical and/or electronic systems within road vehicles, and is the target for compliance of this revolutionary product. 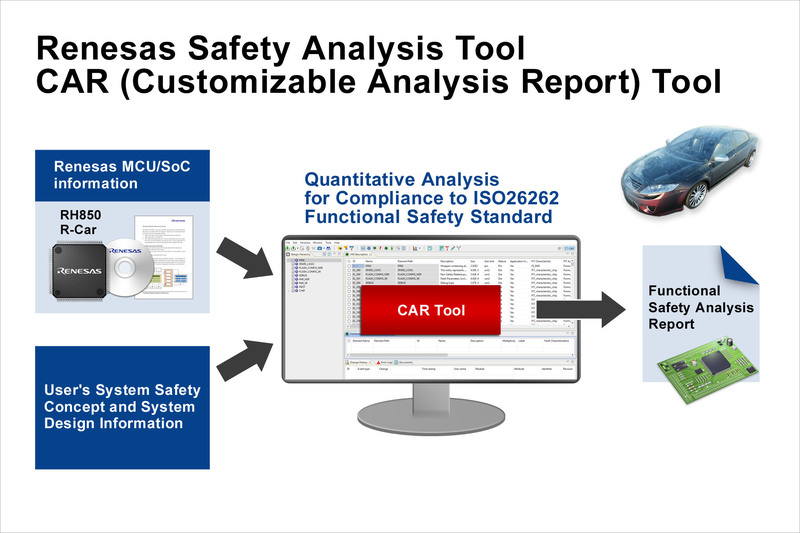 The CAR Tool unifies key aspects of the safety analysis by offering a multi-layered view of the safety-related component, complete with customizable analysis parameters and all of the results required by ISO 26262, such as single point fault metric (SPFM) and latent fault metric (LFM). This innovative tool also provides the user with estimations for both probabilistic metric for random hardware failures (PMHF) and its evaluation of each cause of safety goal violation. These results can be displayed from the entire component down to each single element via different hierarchical levels, accurately splitting its FIT in the appropriate fault class (single-point, residual, latent, etc.) This also makes it easy and effective to browse complex system-on-chip (SoC)/microcontroller (MCU) safety analyses.